State officials say the destructive bugs were found this week in Lebanon and Acton. Entomologists confirmed a destructive species of beetle has been found in York County, officials from the Maine Department of Agriculture, Conservation and Forestry announced Wednesday. The discovery of emerald ash borer beetles in western York County earlier this week is only the second time the invasive species has been found in Maine. Adult beetles were recovered from traps in Acton and Lebanon and field workers from the department are now doing ground surveys in the area, according to state officials. Earlier this summer, Maine entomologists found the state’s first emerald ash borers in several locations around Madawaska along the Maine-Canada border. Those insects were believed to have crossed over into Maine from infestations in neighboring New Brunswick. But officials say the transportation of emerald ash borers – as well as other destructive, invasive pests – in nursery stock or firewood poses an ever-present threat in Maine. A native of Asia, emerald ash borers have killed millions of trees in the U.S. and Canada since being discovered in 2002 and are regarded as one of the most destructive forest pests in North America. As of August, it has been found in 35 states and four Canadian provinces. 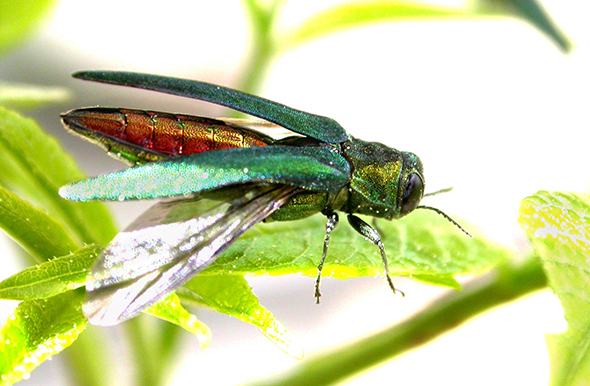 Maine forestry and insect experts long had anticipated that the emerald ash borer would eventually be detected in Maine, and many had suspected it would first arrive in southern Maine because the emerald-colored insect is already established in neighboring New Hampshire counties. The Maine Department of Agriculture, Conservation and Forestry issued an emergency order earlier this summer prohibiting the movement of ash trees or untreated wood from Madawaska, Frenchville and Grand Isle in Aroostook County. Last week, state officials asked for the public’s help locating three ash trees sold by a major retailer that received shipments from a New Jersey nursery that is within a quarantine area for the emerald ash borer. A spokesman for the Department of Agriculture, Conservation and Forestry would not name the retailer or the locations of its stores, saying the agency wants to use the incident as a way to raise the alarm about the emerald ash borer around the state. Federal authorities are expected to impose a quarantine in parts of Maine on ash trees or products response to the insect’s recent discovery, similar to quarantines in place in other states, including neighboring New Hampshire. The small, metallic-looking beetles lay eggs on ash trees and the hatching larvae then tunnel under the trees’ bark, causing extensive damage that typically results in tree death within three to five years. Although there are methods to control the spread of the emerald ash borer, experts have yet to devise a way to eliminate the pests once they are established. Ash trees account for just 4 percent of Maine’s hardwood forest resources, yet are an important species in the state. Ash is used to make baseball bats, snowshoes, furniture, canoe paddles and other products in Maine, and the state’s ash forests have an estimated overall commercial value of $320 million. Untold generations of Maine’s Indian tribes have used ash to weave baskets, and in birch-bark canoes and in other tribal crafts.